Posted on Mon 24 Oct 2011 at 9:09 PM PST. Filed under Recipes. Today I went to the dentist for teeth cleaning and one filling. Now that I’m on this Primal diet (Paleo + selected dairy), I’m hoping to not ever have to visit a dentist again. The interesting thing is that about 2 hours after returning from the dentist I had a very weird urge to eat dairy. I eat lactose-free probiotic goat yoghurt and goat lactose-free hard cheese occasionally, and I supplement with calcium, but this urge was different. It wasn’t a craving per se, it was a need. My husband theorized that my teeth endured severe stress today because of the dentistry, and they depleted the calcium reserves in my body. Unfortunately, my next batch of goat yoghurt wasn’t ready yet, and the only commercial goat yoghurt I could find had… tapioca flour in it. Most Americans think all yoghurts are thick, while this is not the case with goat yoghurt (really Trader Joe’s? flour in the yoghurt?). Even my aunt in Greece who owns ~200 goats, has to add a bit of sheep milk in the mix in order for her home-made goat yoghurt to be less runny. But she definitely doesn’t use… flour, and if she doesn’t have sheep milk at hand, she will simply just make her yoghurt with goat milk alone. So I bought some regular goat milk (with lactose in it, no option) to appease my calcium need. Recently I saw this amazingly-looking Paleo roasted “cereal” recipe, so I had to try something like it. Because time was of the essence, I simply did a “raw” version of it. Works just as well if you don’t have the time to bake stuff. It looked and tasted amazing. Who needs cereal grains when you can have nuts and seeds? 1. Put all the nuts & seeds in a breakfast bowl. If using unsweetened milk, you could optionally add a teaspoon of honey and stir it well in. Add the berries and milk. If using frozen berries, wait for 2-3 minutes for them to get warmer. 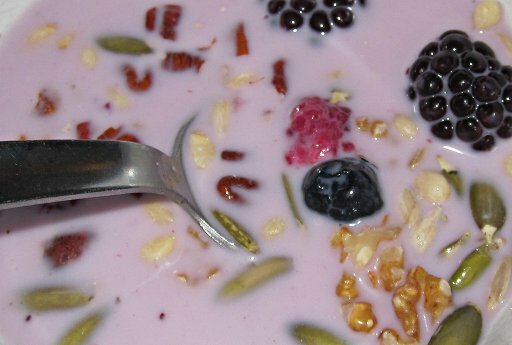 The berries will now release some color into the milk, making it look really interesting. Enjoy! Variation: You can also use hot milk, and a teaspoon of unsweetened cocoa powder! Optionally, a pinch of cinnamon too. Or, you can use a chopped banana instead of berries! 1. If using Brazil nuts, make sure you only use 1 of them, chopped. A single Brazil nut has over 100% of the daily value for Selenium, but it also has the most phytic acid than any other nut, so you don’t want to be overdosing in any of that. 2. Macadamias are great to use in this recipe, but you’ll have to buy them chopped, or use a food processor to chop them. Same goes for hazelnuts, which in addition will have to be skinned. Might not worth the effort for a quick breakfast. 3. Do not use peanuts, they’re not nuts. Botanically, they’re beans/legumes. “Tapioca Flour is a grain-free flour derived from cassava root”, is that not allowed in the Paleo diet? It is only technically Paleo, but not really (poisonous). It is also not allowed in the SCD diet, that I follow in parallel to Paleo for my SIBO issues, since it’s a starch (starch = complex sugars = overfeeding of bacteria/yeast in my gut). But even if it was allowed, you just don’t put flour in a “natural goat yoghurt”. How about pressing this into bars while still warm? Frankly, it looks so tasty I don’t think a liquid bath is necessary. which strand of bacillum are you using for the yogurt? firmness of yogurt can be controlled in many ways, the most effective is right temperature and right strands. I love sheep and goat milk but it’s extremely costly. Unfortunately organic or not they are feed soy and corn. I’m using a commercial multi-strain one, recommended for the SCD diet. Made by Yogurmet, a company that also makes yoghurt makers.